If you own a boat, there will possibly come a time when you’ll want to put it up for sale – if you’re buying a new one, for example. A boat represents a significant investment. Therefore, just as with a house or a car you’re selling, you need to consider several issues if you want to get the best price for your boat when you're looking to put it up for sale. If you’ve got a boat for sale, hiring a professional marine broker may cost you a little in terms of having to pay commission but this additional outlay will often be worth the cost. A good way of appointing a broker to act upon your behalf is to visit boat sales or boat exhibitions and by speaking to a few of them. Alternatively, you could ask your marine lender or boat insurance company for any recommendations of reputable marine brokers. Or by simply asking friends and associates you’ve met who are also boating enthusiasts and who have sold a boat themselves previously if they have any recommendations. When looking at brokers, focus on those who are more likely to represent your boat most favourably when it comes to sale. Boats come in all shapes, sizes and their resale values can differ markedly. So, just as you wouldn’t ask a Ferrari dealership to sell a Mini, make sure that the broker you choose has a lot of experience in selling the same type of boat you have for sale. Of course, you don’t need a broker to sell a boat on your behalf. You could always do-it-yourself and advertise it for sale in one of the many boating magazines, if you prefer. Another advantage of using a broker, however, is that they’ll proactively look for buyers on your behalf as opposed to you waiting for people to respond to an advert. Just as in selling a house, you’ll want your boat to look as good as possible when you’re ready to show it to potential buyers. One of the biggest mistakes people make when they have a boat for sale is that they leave too much unnecessary gear on the boat which not only makes it look cluttered but, to the buyer, it can make the boat appear smaller than it actually is. Therefore, get rid of all unnecessary items and store them elsewhere and just leave on board any equipment which is necessary for any demonstration rides. Empty all interior lockers and storage spaces as well as all the on-deck lockers. Make sure you brush away any debris from the engine and that you wipe off any oil. Also remove all of the water in the bilge. It’s often a good idea to get in a professional company to steam clean the engine compartment and deal with waste materials on your boat. When people are attending boat sales or visiting a boat for sale on the water, they’ll want to be certain that everything on the boat works so make sure you check everything before you invite prospective buyers on board. Things like electrics for lights and cooking should be checked. Don’t forget to replace any broken bulbs, for example. Make sure the boat's engine has new batteries, preferably, or at least make sure the batteries are charged and that the pumps work. Also, check for leaks on your boat and repair if necessary. Although a prospective buyer will be looking at the bigger picture predominantly, it can often be the little touches that make all of the difference between them choosing your boat over a similar boat for sale. Therefore, things like ensuring there’s plenty of disinfectant in the holding tank, and even things like having new mooring lines fitted can make all the difference. Providing the weather is favourable, opening up your boat for a few days prior to showing it will let the fresh air circulate around it and a couple of fragrant vases of flowers or pot pourri can help to get rid of any unpleasant odours that may have built up. 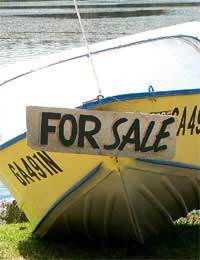 It’s surprising how many people are put off a boat that's up for sale because of an unappealing smell.